After a dismal 2nd year of the family-oriented Cioppino Feast, I suggested a whole new concept, to rebrand the fundraising event and attract a different crowd. A martini bar was added (and a martini glass to the crab logo), as was a very large and varied silent auction. The target market shifted from families to professional adults with disposable income. We were raising funds for our La Jagua project as well as other community projects. The 3rd year saw increased profits by 300%. 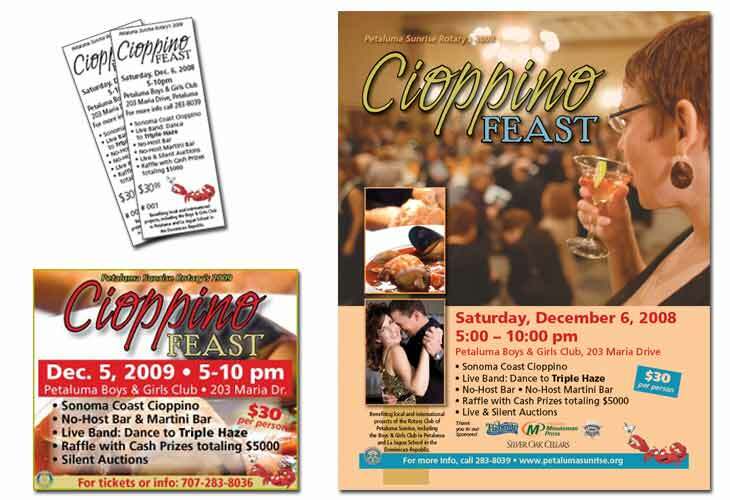 Since 1997, AVM Graphics has been doing branding and marketing for her clients full-time. Based in Petaluma, California, AVM Graphics serves Northern California and parts east (New Mexico, for one).